One of the modern genres arising from the Gothic literature has been crime thrillers, one of the most popular of all modern genres. For example The Sisters of Crime formed in Melbourne are an organization of female writers in Melbourne who specialise in this form which has increased dramatically. Since forming it has grown to 3600 members in 48 chapters world-wide, offering networking, advice an d support to mystery authors. 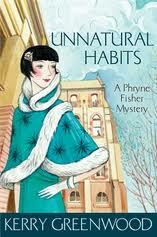 Think of the Phryne Fisher series or the character Simone Kirsch. The most successful murder mystery of the 19th century in the world was The Mystery of the Hansom Cab set in the back lanes of Melbourne. In recent times the book Truth, Lies and the Failure of Justice led to a hanged man being pardoned over 80 years later. The Great Bookie Robbery in Melbourne led to a film and books. And how many film, books and works of art has Ned Kelly spawned? Think Underbelly. Crime suits the dark side of Gothic literature. Combined with murder, mystery, romance, gore, injustice and the lonely PI, you have a winning combination that floods out of our TV screens every night. This genre plays out in our Unsolved Crimes Tours in the CBD and St Kilda conducted by arrangement at night or by day. Other relevant tours are the Paranormal Tour, Queen Victoria Market Cemetery and the St Kilda Literature Tour. Inquiries melbwalks@gmail.com or 0408894724.